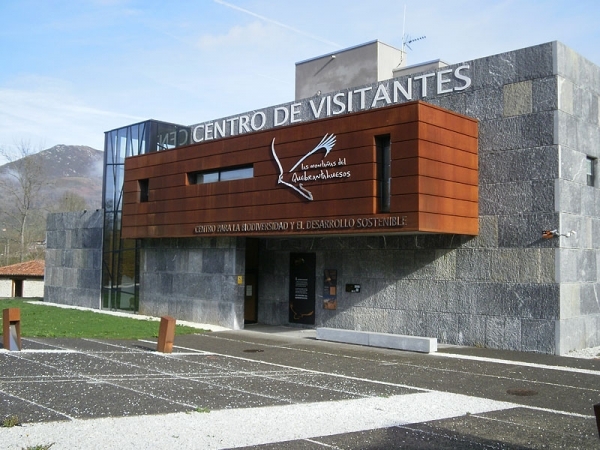 Inspired by the mountains of the Picos de Europa, the Centre for Biodiversity and Sustainable Development “Las Montañas del Quebrantahuesos” offers visitors a space for meeting, participation and awareness. It aims to be something more than a centre of interpretation and reception of visitors, since it has been conceived as a place open to society, in which study and interest in the natural sciences is fostered, initiatives for the conservation of nature and sustainable development are promoted and developed, and environmental awareness and education activities are organised. The Centre shows, through Science and Education, a more sustainable way of life. With the three elements “shepherds, mountains and Lammergeiers” as a common thread, a permanent interpretative and interactive exhibition represents the understanding between natural and cultural processes, between Man and Nature, biodiversity and Society, innovation and the tradition of those who have occupied these mountains since ancient times. The Centre also has an eco-laboratory in which visitors can take part in environmental workshops, and a training and meeting room where they can learn about nature in the Picos de Europa and conservation programmes, highlighting the Lammergeier Recovery Program in the Picos de Europe. Moreover, the Centre is located in a natural environment, at the gates of the National Park of the Picos de Europa, which allows you to enjoy mountain landscapes, green areas and playgrounds, as well as elements of traditional culture and local cuisine. The construction of the Centre “Las Montañas del Quebrantahuesos” has been financed by the Principality of Asturias, and it has been equipped by the ‘La Caixa’ bank´s social fund. It is located on land owned by the Council of Onis and is managed by the Foundation for the Conservation of the Lammergeier. 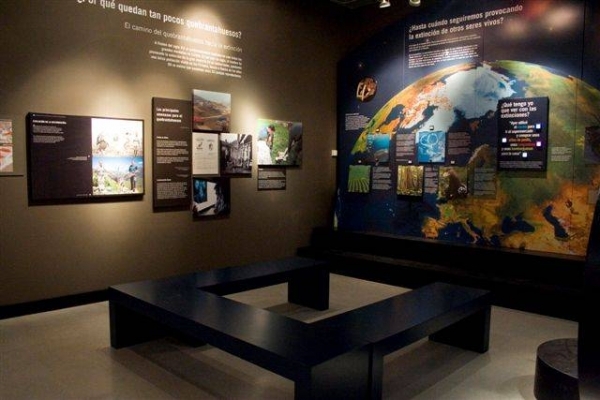 The Centre ‘Las Montañas del Quebrantahuesos’ has two floors of exhibitions that the visitor can explore alone, with or without the addition of an audio guide, or in a group during the guided tours. 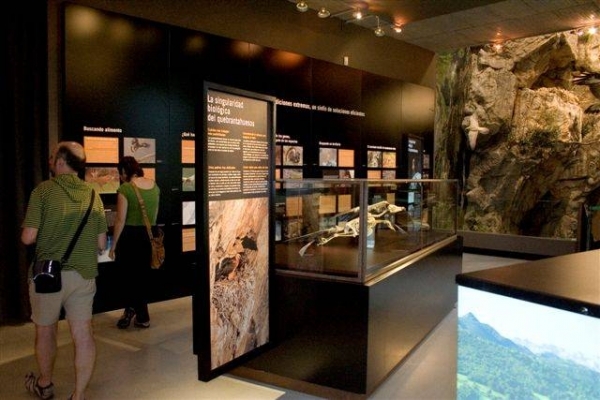 The visit begins with an interesting audiovisual presentation that introduces the visitor to the history of the geological and biological formation of the Picos de Europa. This highlights the sheep and goat farming as an important cultural element that is responsible for the model of the current landscape, at the same time as it frames the Recovery Program of the Lammergeier in the Picos de Europa. 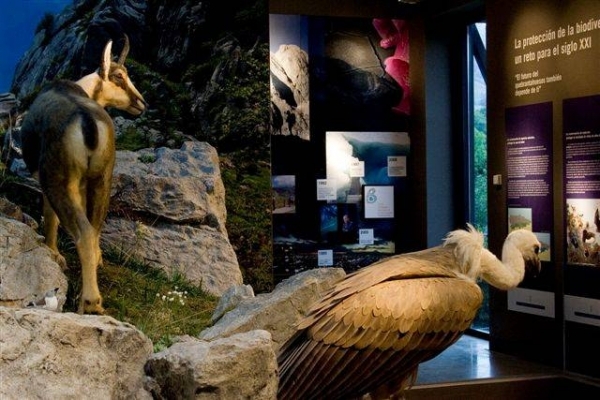 Throughout the different rooms of the exhibition, linked by the common thread of shepherds, mountains, and Lammergeiers, the visitor can delve into highlights of the biology, ecology and ethology of the Lammergeier, be surprised by the incredible adaptations of living beings to the high mountain environment, and learn about the importance of the shepherds in their role as generators of biodiversity, as well as their traditional trade, and their interaction with the environment. 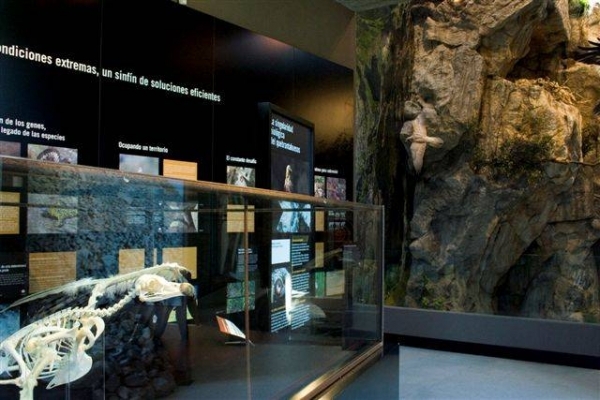 A vertical model of a limestone cut dominates the central area of the exhibition with reproductions, on a natural scale, of 30 species of flora and fauna characteristic of the Picos de Europa. After learning about the initiatives that the Foundation for the Conservation of the Lammergeier has been developing since 1995, and the reintroduction of the species in the Picos de Europa, the visit ends with an audiovisual presentation that offers a general view of the current environmental problems and man’s ability to improve his environment and conserve the species that still exist. Monday to Friday: from 8:00 a.m. to 4:00 p.m. Weekend closed. Monday to Sunday: from 11 a.m. to 3 p.m. and from 4 p.m. to 8 p.m.
Groups of 20 people or more. Children from 0 to 6 years old. Guided tours are held every day during the summer season at 1:00 pm and 6:00 pm. Maximum capacity 25 people. Reservation is recommended. The program of Education and Environmental Awareness is carried out from the Centre for Biodiversity and Sustainable Development “The Mountains of the Lammergeier” and is mainly aimed at educational centres, giving preference to students in the third cycle of primary education (5th and 6th) and the irst cycle of compulsory secondary education (1st and 2nd), whilst also covering the remaining levels of primary, secondary, baccalaureate and vocational training. In general, the educational programme includes field trips, guided visits to the Centre´s permanent exhibition, environmental workshops performed in the Eco-laboratory, and participatory games, as well as a series of educational activities in relation to field research. Route 1: Take A-8, exit 310 towards Posada de Llanes, continue on AS-115 and then AS-114 towards Cangas de Onís until you reach Benia de Onís (From Posada, 19 km, 23 min approx.). Route 2: Take A-8, turn off direction Arriondas and continue on AS-260. In Arriondas, take the exit towards A-625 and then AS-114 until you reach Benia (Arriondas 23 km, 27 min approx.). Route: Take AP-66, then A-66, exit 47 and join AS-1. Take exit A-64, continue on A-8, take exit 310 towards Posada and continue on AS-115. Then continue on AS-114 towards Cangas de Onís until you reach Benia de Onís (from León, 224 km, 2 hours and 27 minutes approx. ).